Aid workers report high levels of depression among older people – the trauma they have experienced being compounded by the horrific situation in which they now find themselves. A Rohingya man carries his mother into their tent walking in the muddy stairs, Palongkhali, Teknaf, Bangladesh. One older woman we spoke to has been left alone with three young grandchildren aged 9, 7, and 2, after their parents disappeared. They are too young to be sent to fetch aid, and she is not physically able to reach the registration points. She was extremely distressed, wondering not only what happened to her daughter and son-in-law, but also how she and her grandchildren will now survive without someone to help them. In order to get around the camp, many older people must be carried by family members. But it’s a difficult task, and not everyone is lucky enough to have family members that can do this for them. 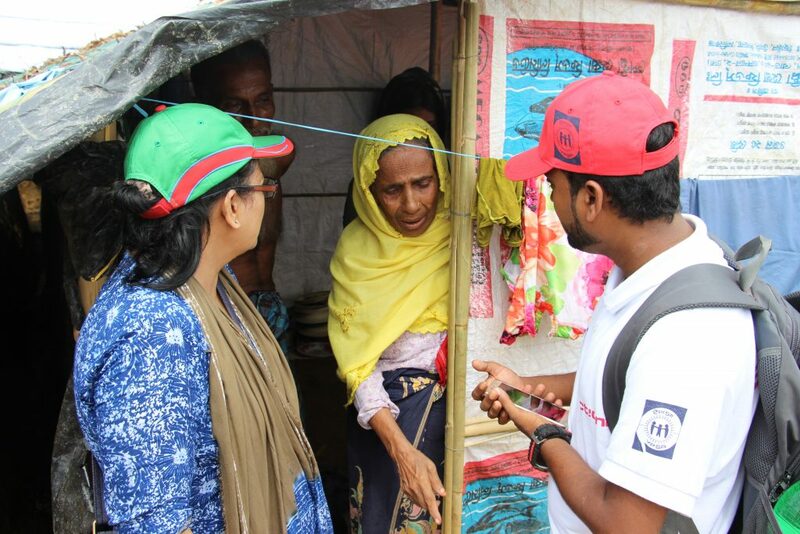 Rabeya Sultana, Country Director for Bangladesh, reports that most older people she has met are stuck in their shelters, unable to move, even to go to the toilet. 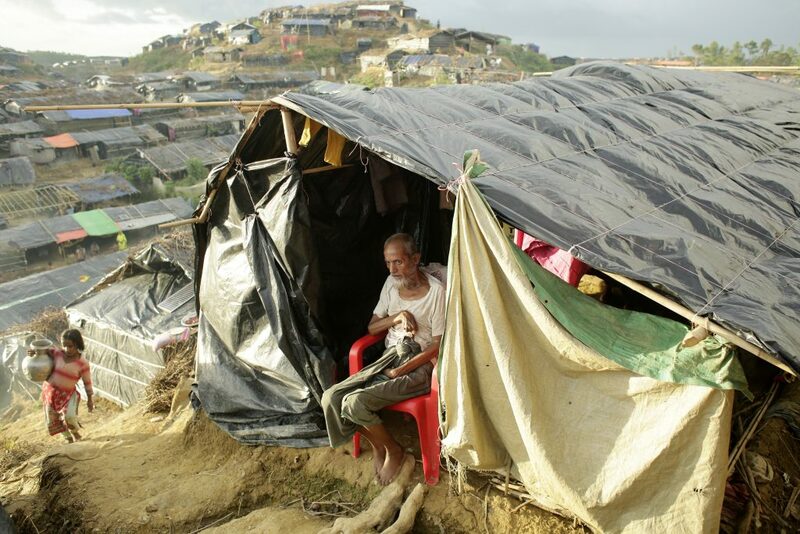 People have set up makeshift tents wherever they can find space – by the side of the road, and on steep hillsides. For older people with mobility issues, these circumstances present various dangers. The tents in which older people are sheltering – wooden frames, covered in plastic sheets with no windows – are functioning like hot boxes, creating suffocating heat and leaving older people dehydrated and frail. Age International’s partners are working to set up age-friendly spaces in Mainnerghona where 80,000 people are now living. Age-friendly spaces are a refuge for older people, where they can feel safe and find the practical help that they need, as well as the emotional support. At our age-friendly spaces in Bangladesh, older people will have access to specialist healthcare, provided by medical staff trained in older people’s needs. They will also have a dedicated space for counselling for the trauma that they have experienced, as well as accessible latrines designed for people with mobility problems, and clean water for them to drink. These spaces will be a vital refuge for older people who have already suffered through so much. Please, help us support them. Donate now. I always think about the old people who suffer during political mis under standings. Why don’t the international community come in before people get suffered? It is more better to prevent the situation than giving support after.